Among the various and random things I love in life is a great social gathering. Oh, and twinkle lights. And animals acting silly. And a nice glass of wine. I think I may be in luck this December at Potter Park Zoo - the location of several of my absolute favorite events in mid-Michigan this winter. It was 100 years ago in 1915 that Lansing resident Mr. Potter and his wife donated land to the city that would soon become Potter Park and Potter Park Zoo. These were the exciting times of growth for Lansing. Mr. Potter had contemporaries like auto pioneer Ransom E. Olds and developer Edward Sparrow, whose life events were making their own marks in the community. Even more land was contributed, totaling over 100 acres, and by 1920 the city extended the streetcar line to make the park accessible to all. The land included a beautiful oak forest and was situated along the Red Cedar River, (all of which you can still enjoy today) and the first occupants of the zoo were animals like elk, a bear, a pair of raccoon, and several deer. A modest start, but it was the beginning of a very nice city zoo. Today this beautifully landscaped 100-acre park, gardens, and zoo are conveniently located just south of I-496 on Pennsylvania Ave. and are open all four seasons, with special events sprinkled throughout the year. In fact, it appears that some of the zoos residents actually prefer the colder weather like the snow leopard, the wolves, and the arctic fox. And the penguins. You can still enjoy seeing the antics of the lions, tigers, mandrills, and lemurs. In fact, the zoo is home to more than 400 animals from around the world, and all of them are right here, sharing in the excitement of winter events in mid-Michigan. With over 160 species, many of them are either on the endangered or threatened list, and we are able to observe them in this protected environment. Favorite time for me to go visit Potter Park Zoo now that Im an empty-nester? Enrichment days and special events. Follow Potter Park Zoo on Facebook and theyll keep you updated. I get my fix of twinkle lights during Wonderland of Lights. The zoo is transformed into a magical winter wonderland with thousands of holiday lights and extraordinary displays. Running Thursday, Friday, Saturday, and Sunday evenings from 58 p.m. now through December 27th. (Closed on Christmas Day) Check online because theres a Toys for Tots drive with free admission, and I hear that Mr. and Mrs. Claus will be there select times as well. Admission for Wonderland of Lights: $7 adults, $5 for kids 312 and free for kids under 3! This is definitely one of the top light display events in mid-Michigan - a must-see for families with kids of all ages! And I do appreciate their Wine & Stein fundraising events they have throughout the year. Next one coming up is the winter edition on Wednesday, December 2nd from 58 p.m. Enjoy tastings of beer and wine plus hors doeuvres from local restaurants. As a born and bred Michigander, I&apos;ll never pass up an opportunity to attend one of the most delicious food, wine, and beer events in mid-Michigan. Add live music and its a great event. Admission to Winter Wine & Stein is $35 or $30 for members. 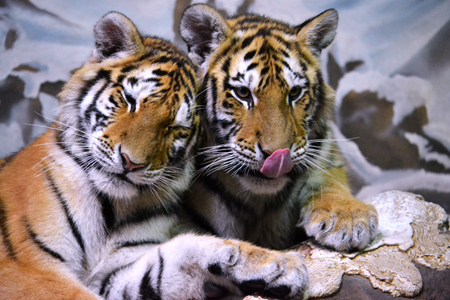 Regular winter zoo hours are daily 10 a.m.4 p.m. until April. Winter admission: Adults $2, Ages 312 $1, ages 2 and under free. Special event admission prices may vary. Check their website year round for fun events in mid-Michigan.